Grateful for bad examples and laziness (gratitude #48) - Scientific Ink . We missed the first season, but heard enough about it at the launch of season two that we caught up with Netflix and DVRed this season. We’ve been enjoying it, especially me because I work in Internet Marketing and have worked with several advertising agencies. So, it is fun to see the field in its early heyday. 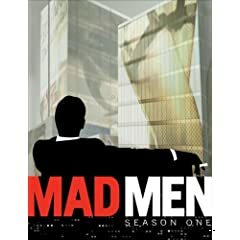 I’ve been astonished by a few things in the show – how much alone office thinking time the creative team at Sterling Cooper has. I don’t disagree that quiet time is critical for creative work, but I can’t believe the amount of open time these folks seem to have in their schedules. Perhaps it is just for affect in the show…or maybe there really was room in the world for that many martini lunches and that much staring out the window. I don’t know, but my days are much more harried than theirs seem to be. Maybe I’m doing something wrong. I do know I’m doing at least one thing right. What has most amazed me me is the systematic infidelity on the show, and the effort they need to spend on maintaining the artifice and the relationships (spouse and other). It just looks like an immense amount of work. So much so that last weekend, I joked to my husband that the two of us are much too lazy to make anything like that happen. And that’s certainly a good thing.